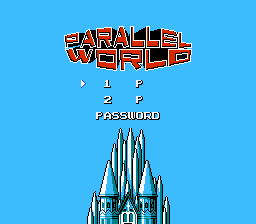 Parallel World is a surprisingly good, if not particularly original, puzzle game. When I first looked at gameplay screenshots, I admit that I didn’t think much of it, but now that I’ve actually tried it, I’ve been pleasantly surprised. 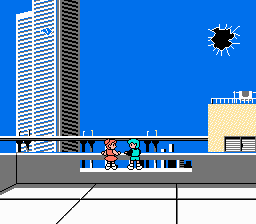 The game stars two children who witness the sky break open and are drawn into the void and, thus, a parallel world. 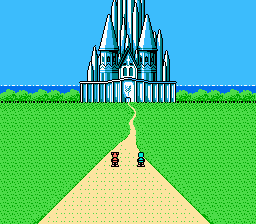 They see some sort of strange castle and feel compelled to explore it. Or something. That’s what I got out of the game’s introduction, anyway. Speaking of, the intro is actually rather pretty. Colors are used well, the characters are animated competently, and the hole breaking open in the sky is a fairly neat effect. That said, the actual levels in the game, which are very much tile-based, feel much more cluttered than they actually are. 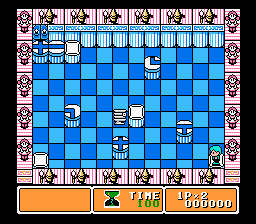 This is probably in part due to the dancing thingies that border the level, and in part due to the checkerboard pattern of the floor. It creates a lot of visual noise which, personally, I could have done without. The game itself is fairly standard puzzle fare. Your objective is twofold - first, you need to push the path-patterned pillars into enemies to crush them. One of them will be carrying a key that will unlock the door to the next area. Second, once the door is open, you need to manipulate the pillars with paths drawn on them to let you reach the exit. You do this by pushing them around and rotating them to create a single steady line from an immovable white pillar to the exit door. It gets difficult pretty quickly. All that needed doing, apparently, was the title screen and credits, but they’re done, so booyah!